A portable oxygen concentrator makes a real impact on the daily life of three year old Tayyabah. She has a heart condition and has depended on artificial oxygen since birth. Tayyabah is growing and developing well but routine life is difficult for the family especially when it wants to go out for pleasure and even trips to drop off the other children at school are complicated. 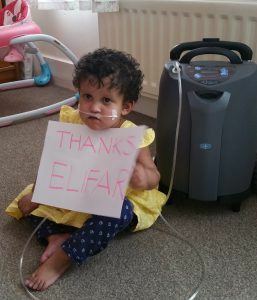 Elifar has funded this £3,840 portable concentrator which enables Tayyabah to take part in many more daily activities and is a real practical help as she starts nursery school.